Hello For Your Marriage readers! Happy New Year! 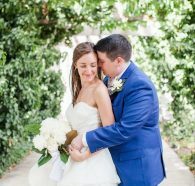 We’re Brooke Paris and Timothy Foley, and we are so honored to introduce ourselves as the new engaged bloggers here on For Your Marriage. We’re getting married on June 30, 2017 and we could not be more thrilled to share our journey with you as we prepare for the Sacrament of Marriage. Over the next year we will be sharing all about our love story, wedding planning, marriage preparation, the big day, and the start of our married life. Today, Brooke is going to give us a quick introduction and then share with you all about how we met, fell in love, and followed God’s call to the vocation of marriage. Timmy and I both grew up in southeastern Virginia and met in 8th grade religion class. I sat right behind Timmy and, before class began, tapped on his shoulder, smiled and waved at him very quickly. It wasn’t until a few years later that Timmy told me that our first encounter terrified him slightly – you see, 13-year-old Timmy was home-schooled prior to that year and hadn’t had many interactions with girls, so when a “pretty girl” (his words, not mine!) smiled and waved at him from a foot away, he froze! A few months into that year we became inseparable as best friends. Over the course of the next few years, we were told many times that we should date, but it wasn’t until October of our junior year that we decided to give it a shot. Turns out, he had liked me all along, though he only revealed that to me a few months before we started dating. I hesitated in my decision to go out with him – he was my best friend. “What if it went poorly? Would it ruin our friendship?” I thought to myself. While that fear weighed on one part of my heart, another, and stronger, part of my heart told me that if Timmy and I ever started dating, we’d never stop. That would be it, we would spend the rest of our lives together. As amazing and accurate as that intuition was, it scared 16-year-old me. Was I ready to start my journey with the person I would spend the rest of my life with? Then, one night we were talking about our futures and the kind of people we thought we’d eventually marry, and it suddenly dawned on me that Timmy was that person that I saw by my side at every stage of my life. We had our first date a week later, and the rest, well, is history. We knew by our one-year dating anniversary that God was undoubtedly calling us to marry one another. However, the next four years consisted of us going to different colleges, learning how to cultivate our relationship even though we saw each other only once or twice a month, and allowing God to shape us into radically different people than we were when we became best friends at age 13. Over those years, even as God worked in our hearts to make us more into the man and woman He has destined us to be, we grew closer and deeper in love. Developing a shared spiritual and prayer life was a major area of growth during this time, though the distance made it hard. A major focus of our prayer life has always been the love Christ showed for His Bride on the Cross. It is that sacrificial, self-denying, and painful yet beautiful love that carried our relationship through our college years. It was so fitting, then, that it was the Good Friday of our senior year (which was also the Feast of the Annunciation!) when Timmy dropped to one knee and asked me to be his bride. We started off Good Friday with a tradition that we’ve been doing for a number of years now – praying the Stations of the Cross for Married Couples and Families. While we obviously knew that we were neither of those things, that is the vocation we were preparing our hearts for, and so the prayers were helpful to us in understanding what the true call of the cross is in married life. After praying the Stations, we went to Good Friday Liturgy, followed by praying the Divine Mercy Chaplet. As we were walking back to my residence hall, Timmy asked if I wanted to go pray in our favorite chapel in the Basilica of the National Shrine of the Immaculate Conception – the Mary, Queen of All Hearts Chapel, which is dedicated to St. Louis de Monfort and his Marian consecration. We’ve prayed here many times throughout our years in college and Marian consecration has played a huge role in our relationship. As we knelt in the chapel, a surge of hope swelled in me that this might be the moment Timmy was going to ask me to marry him! I was nervous and excited at the same time…however, after kneeling for a good number of minutes, I came to the conclusion that I was wrong, and Timmy would not be proposing there. Looking back on it, his proposal was perfect. We spent the whole day in prayer, engaging in spiritual traditions that have been so important to our relationship, and turning our hearts towards the sacrificial love of Christ that we have now promised to embody for each other for the rest of our lives. Since then, we have dove into marriage prep and wedding planning and have learned so much about ourselves, about each other, and about this wonderful vocation that we are called to. We can’t wait to share more of our journey with you all in the coming months!